B = designMultirateFIR(L,M) designs a multirate FIR filter with interpolation factor L and decimation factor M. The output B is the vector of designed FIR coefficients. To design a pure interpolator, set M to 1. To design a pure decimator, set L to 1. B = designMultirateFIR(L,M,P) designs a multirate FIR filter with half-polyphase length P. By default, the half-polyphase length is 12. B = designMultirateFIR(L,M,P,Astop) designs a multirate FIR filter with stopband attenuation Astop. By default, the stopband attenuation is 80 dB. 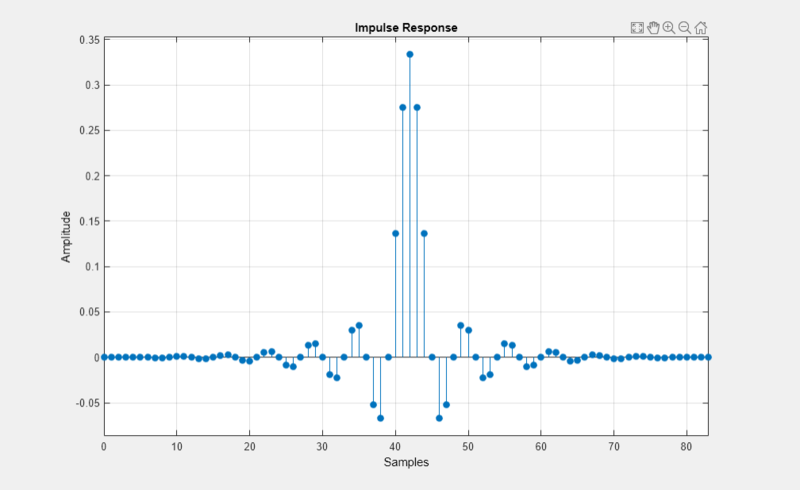 To design an FIR Interpolator using the designMultirateFIR function, you must specify the interpolation factor of interest (usually greater than 1) and a decimation factor equal to 1. You can use the default half-polyphase length of 12 and the default stopband attenuation of 80 dB. Alternately, you can also specify the half-polyphase length and stopband attenuation values. 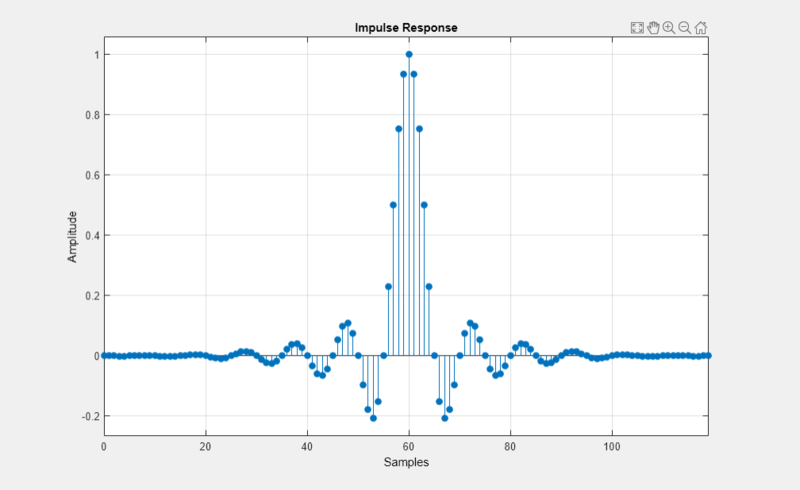 Design an FIR interpolator with interpolation factor set to 5. Use the default half-polyphase length of 12 and the default stopband attenuation of 80 dB. To design an FIR Decimator using the designMultirateFIR function, you must specify the decimation factor of interest (usually greater than 1) and an interpolation factor equal to 1. You can use the default half-polyphase length of 12 and the default stopband attenuation of 80 dB. Alternately, you can also specify the half-polyphase length and stopband attenuation values. Design an FIR decimator with decimation factor set to 3, and half-polyphase length set to 14. Use the default stopband attenuation of 80 dB. To design an FIR Rate Converter using the designMultirateFIR function, you must specify an interpolation factor and decimation factor of interest (usually greater than 1). You can use the default half-polyphase length of 12 and the default stopband attenuation of 80 dB. Alternately, you can also specify the half-polyphase length and stopband attenuation values. Design an FIR rate converter with interpolation factor set to 3, decimation factor set to 4, half-polyphase length set to 14, and stopband attenuation set to 90 dB. Interpolation factor, specified as a positive scalar integer. To design a decimator only, set L to 1. Decimation factor, specified as a positive scalar integer. To design an interpolator only, set M to 1. Half-polyphase length, specified as a positive scalar integer. Stopband attenuation in dB, specified as a nonnegative real scalar greater than or equal to 0. Multirate FIR filter coefficients, returned as a real-valued N-length vector. If both L and M are equal to 1, then N equals 1. If L > 1, R = L.
If L = 1, R = M.
For more details, see the Algorithms section. designMultirateFIR designs an (N – 1)th order, Rth band Nyquist FIR filter using the N-length Kaiser window vector to window the truncated impulse response of the FIR filter. Filter length, N is defined as N = 2*P*R and R is defined as explained in B. 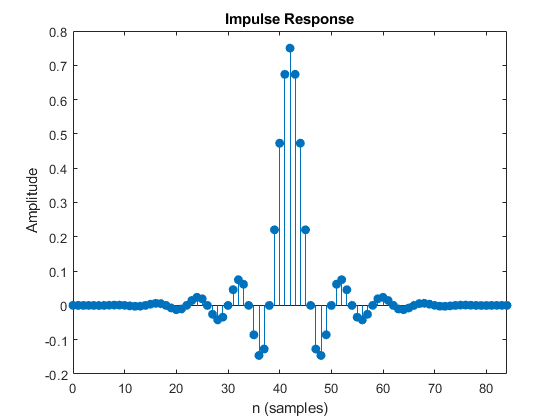 For every Rth band, the impulse response of the Nyquist filters is exactly zero. Because of this property, when Nyquist filters are used for pure interpolation, the input samples remain unaltered after interpolating. A Kaiser window is used because of its near-optimum performance while providing a robust way of designing a Nyquist filter. The window depends on two parameters: length N + 1 and shape parameter β.
where I0 is the zeroth-order modified Bessel function of the first kind. where Astop is the stopband attenuation in dB. h(n) for n = 0,..,N/2,...N are the coefficients of the multirate filter. These coefficients are defined by the interpolation factor, L, and decimation factor, M.
The inputs to the function must be constants.